I am just gonna throw this out there – sometimes I loaaaathe my skin. It breaks out constantly (and I just turned 29), it looks blotchy all the time, it’s super sensitive to EVERYthing, and to top it all off – I have scars left over from the acne of my teenage years. How rude! When I feel like I want to strangle my skin…especially when it’s feeling oh-so-yucky…I go to my fridge. And eat. I’m serious. Usually when my skin is freaking out, it’s because I haven’t been taking good care of it. Meaning, I’ve been eating TONS of sugar & processed things that I know aren’t the greatest skin helper-outers (that’s totally a word now). There are so many natural (ie without chemicals) ways to help your to get glowing skin. 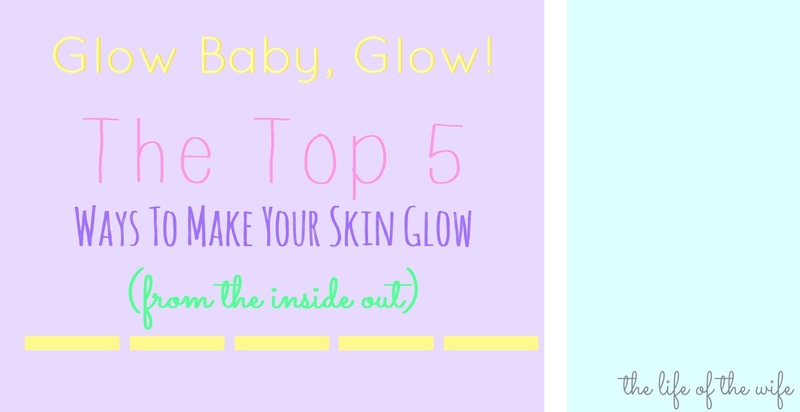 I’m going to share the TOP 5 NATURAL WAYS I get my glowing skin – from the inside out. I started making green smoothies when my Mom started doing it 2 years ago. I thought she was crazy. They tasted gross & smelled oh-so-bad. I have learned to love them (there are TONS of good recipes out there now – try this one or this one) by adding a little honey & less kale. I will NEVER stop making them now. I not only can FEEL the benefits of making a smoothie every morning, but I can SEE it right on my skin. Avocados, we know, are a superfood. 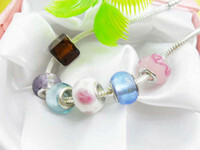 They help you ABSORB all the good nutrients you eat throughout the day. So, I basically live on avocados when my skin is being annoying. I mash them up and put them on just about everything. Or I make THIS yummy cucumber salsa and add avocado to it. It’s the bomb. Trust me. Mangoes are so dang good for your skin. Technically, they have tons & tons of carotenoids in them. What does that mean? 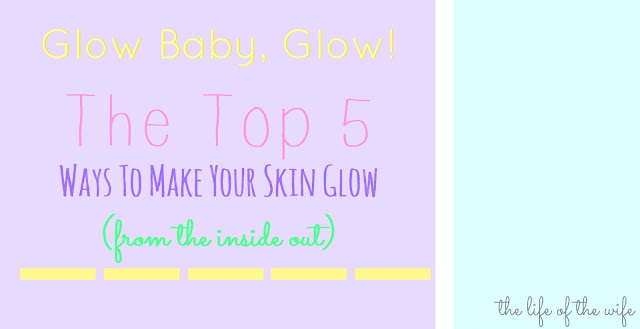 Those babies make your skin glowy from the inside out. They help improve the pigment/look of your skin so it gets that dewy glow. Plus, they’re delish! I even make THIS mango mask – I can’t stop smelling myself after! You’ve probably heard of coconut oil by now. I first had it on toast with honey (try it! ), and soon after, started reading up on the benefits of this wonder oil. Lemme tell ya, there’s not much coconut oil CAN’T do. I use it as a moisturizer for my skin. I was SO scared it would break my skin out – but the oils do the exact opposite. It’s a little wonder in a jar, I tell ya! Then, I use it as a face wash at night. You only need a little tiny bit. Wet your face, rub a little all over and dab off with a wet washcloth. Bam – super moisturized skin. Check out these other ways you can use coconut oil! It’s crazy!! Can I get a DUH? :) Water water water. When my skin is giving me fits, seriously I start chugging water like nobodies business. I know it’s a super obvious one, but really. Drink water, my friends. I have a HUGE jug & I just fill it with water about 6 times a day. Yes, I have to pee like a racehorse (especially being prego), but it works. I can see the benefits almost immediately. Cut out those sugary drinks & detox with water. What do you do when your skin is acting like a teenager? Do share! I knew there was a reason I have 2 jars of coconut oil in my cupboard! I never thought about adding it to my smoothies. And love the toothpaste idea. Brilliant!!!! Thank you I need to give my dull skin some glowing life! When my skin is acting up (I’m 35 and still breaking out at times), I increase my water intake! Water, water, water is RIGHT! I also keep my skincare regime pretty simple, gentle cleanser morning and night, gentle moisturizer (even with my oily/combo skin, I moisturize), and spot treat (not the whole face) with a good pure 2.5% benzoyl peroxide cream/gel. I also change my pillowcases every 2 days. Seems to help. But, yes, WATER, WATER, WATER!